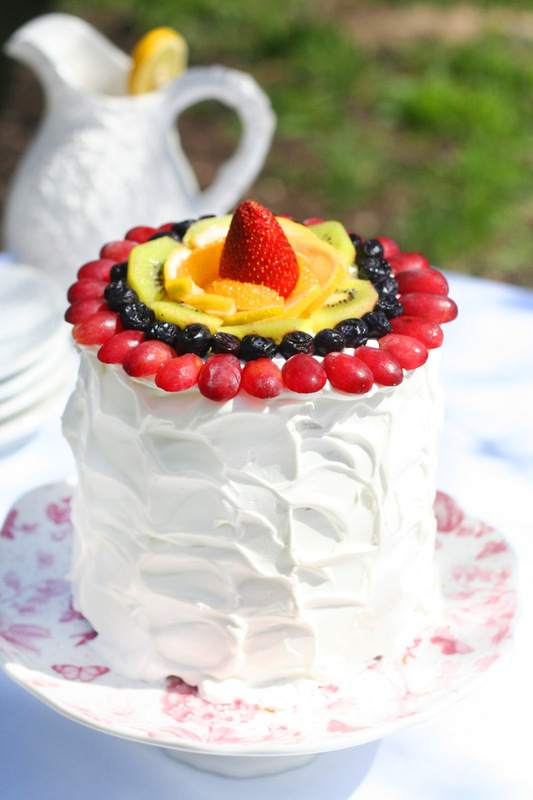 Mothers can be lovely, sweet, tart, sassy, and come in as many colors as the rainbow - hence this amazing Mother's Day cake, baked with love by i am baker! 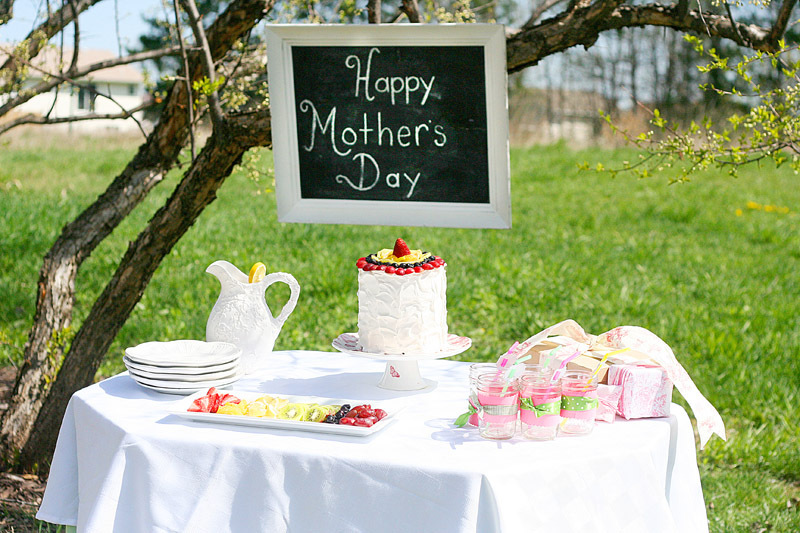 To all of the amazing moms out there - enjoy this colorful inspiration and recipe! I just added the following ingredients* directly to the batter, combined, then poured into prepared pan. 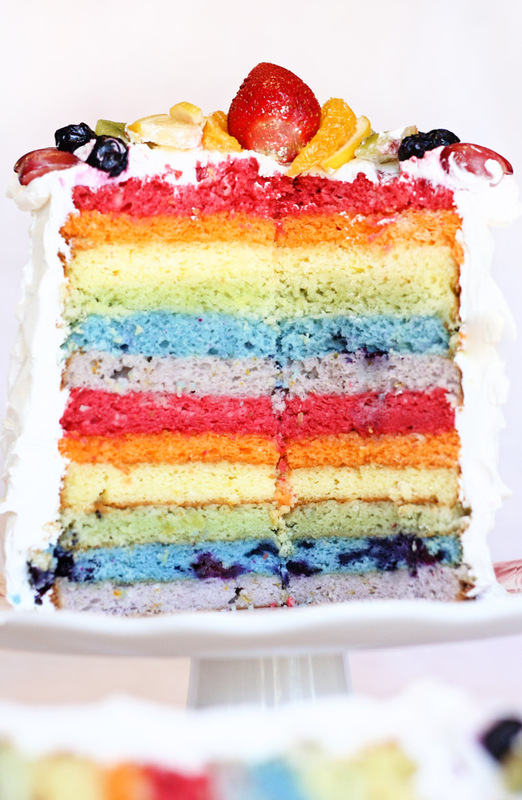 To achieve the 'double' rainbow effect, I just cut the layers of cake in half after baking. Allow your cake to cool completely, or better yet, refrigerate for a couple hours, and then cut the cake into two layers. Since I decided not to use frosting between the layers because this cake was going to be so tall, I just made a simple syrup and brushed that on between the layers. Put into a pan, stir occasionally, and bring to a boil. Once boiling, remove from heat and let cool. 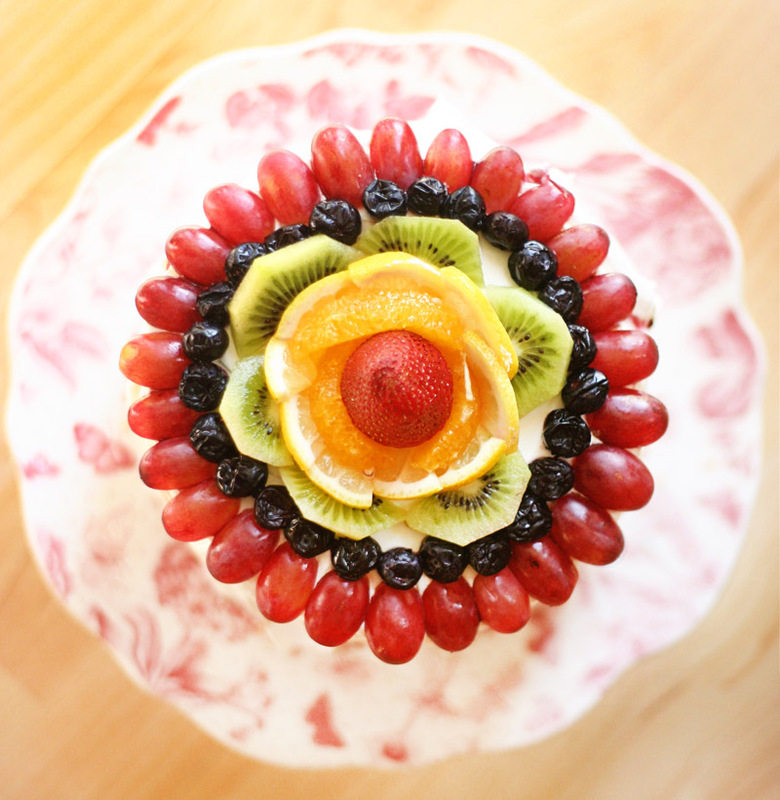 This allowed the cake to stay nice and moist, and also brought out the wonderful natural flavors of the fruit. To assemble, place purple (or grape) layer on your cake stand, brush on simple syrup, then blue (or blueberry) layer. Buile your rainbow up from purple to red, then repeat to achieve the double rainbow effect. For the frosting, I purchased a large container of whipped cream and just smoothed it all over the cake. I went back with a knife and added some swirls for a textured effect. For the fruit on top, I started with grapes cut in half and made a circle around the edge. Then blueberries, then kiwi cut into small pieces, then lemon slices cut into 1/4ths, orange slices, then one pretty strawberry for the center. I would serve this cake right after assembly, as the fruit will only stay fresh looking for a few hours, at most 12 hours.